Note from Editor: Howard Lamey, in Jacksonville, Florida, has retired from a full-time job in advertising that included designing window displays for a major retailer. Now he has turned those artistic talents to designing and building vintage-style cardboard buildings for his family and friends. Howard now has his own site, LittleGlitterHouses.com, but he continues to graciously share his craft knowledge with our readers. 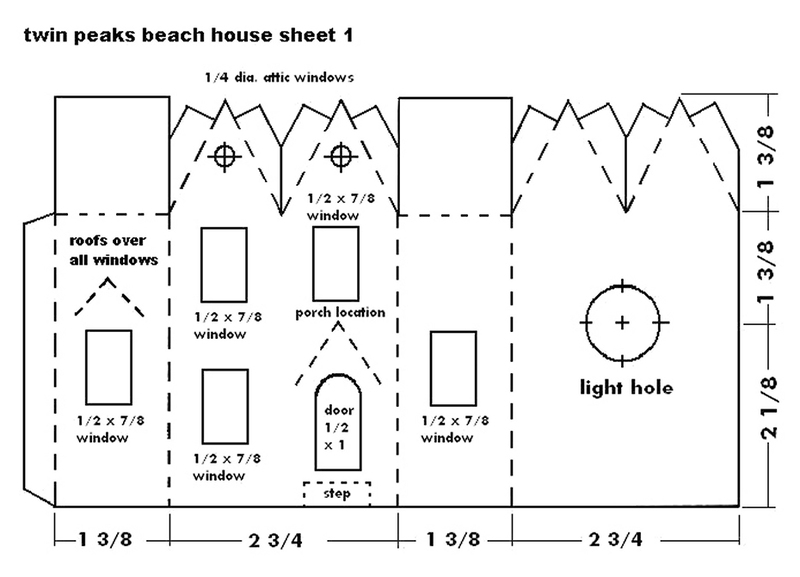 This project is a followup to our Sandy Shores™ Lighthouse project that was published in January, 2009. We have finished this house in "seaside" colors that are typical of seaside houses in many parts of the United States. 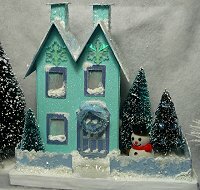 If you like the shape, of course, you are certainly welcome to use other colors and refinish it for a Halloween or Christmas village. If you do make one, please send us photos, that's our best reward for providing these projects. First of all, you need cardboard, such as that from cereal boxes, the backs of writing tablets, anything flat, firm and clean, that you can save. Please keep some corrogated cardboard on hand, too - it makes the best bases. Colored paper for the windows. You can make your own color up to print and print it onto paper or vellum if you wish. 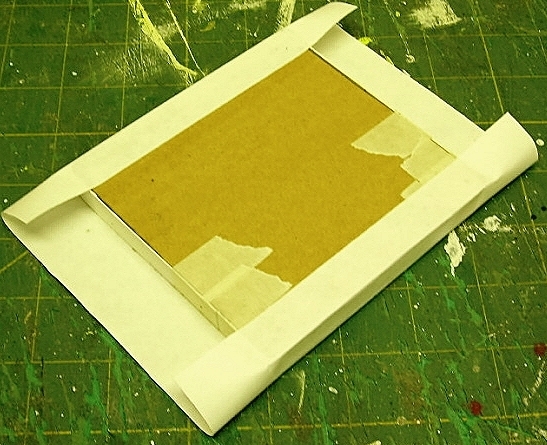 Colored card stock for the windowframes (or you could use cereal-box cardboard, but you'd have to paint it). Acrylic paint in the colors you plan to use for the house. Include a neutral sand or beige color for painting the base. Other accessories, such as palm trees or sea grass, that you plan to use to finish the house. Double-click on the plans above to see the large versions. You should be able to print the big version at the size you need either of the following ways. If you don't have Adobe Acrobat Reader on your computer, or for some reason that doesn't work, open the big JPG versions by clicking on the reduced plans above. Choose the "file, page setup" from your browser. When the page setup menu comes up, select "landscape mode." If you CAN choose to NOT scale the picture, do so. This may mean that part of the page gets clipped on your printer, but the plan should sprint to the right size. If they don't you should be able to tweak the size either in the print program or in any graphic program you have on your printer. 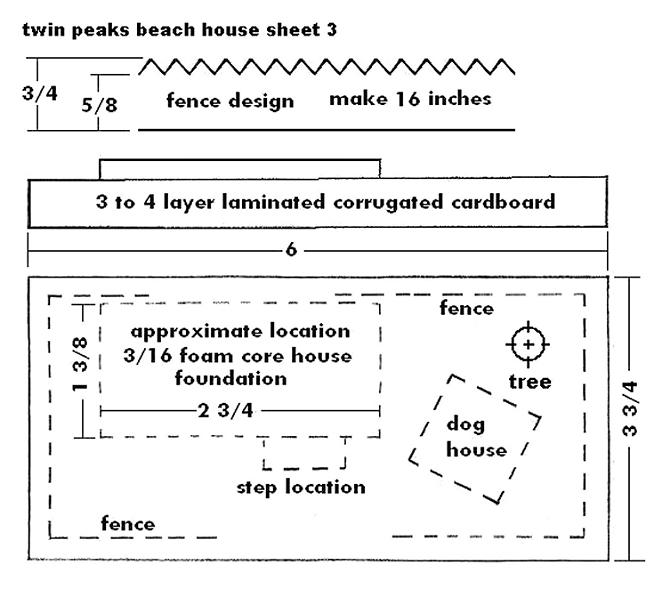 The base is a rectangular "box" that is decorated before the house and doghouse are installed. For this project, it should be about 6" long, 3 3/4" wide, and about 1/2" high. Note: For this project, I cut the base and fence pieces out at the same time. The fence pieces are made from thick card stock such as the back of a writing tablet. If you wish, you may use different materials for the fence, including miniature wooden picket or snow fence from the craft store or a rustic rail fence you make from twigs. 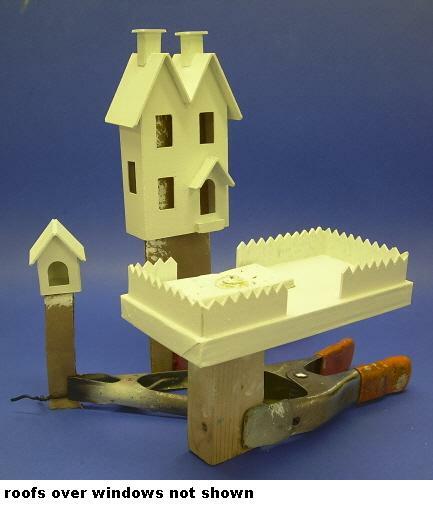 Note: For this project I also added a sub-base for the house and doghouse. 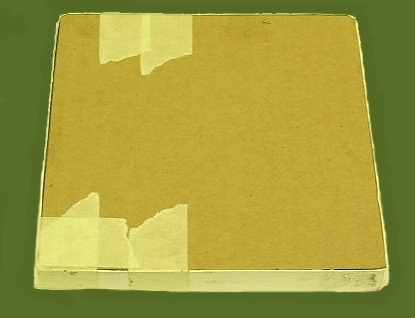 These are rectangles of thick corrugated cardboard that fit just inside the bottom edge of those structures (you'll need to trim them to fit). 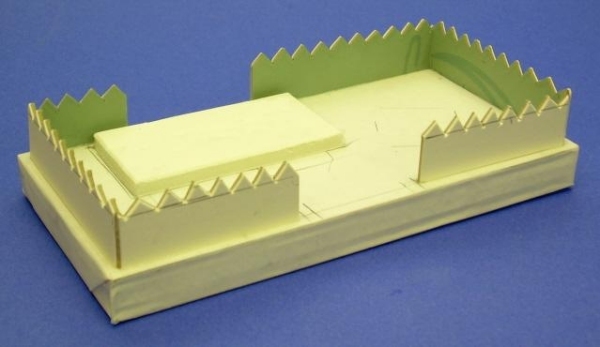 They give the structures more strength, and they provide more area to hold glue when you are gluing the structures to the base. In the photo below, you can see that I glued the house's sub-base to the base before I painted the base. Later, I glued the house down around it. 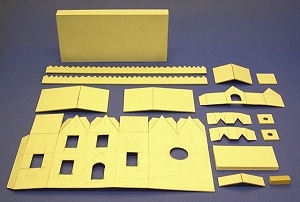 Score the fold lines before you begin cutting out the parts (although you may do the roof parts later, if you wish, after you've checked the fit and the overhang). Use the metal ruler or other steel edge as a guide. Double-check the roof size. The most important thing is that the two pieces meet nicely in the middle. The roof should also have a fairly even overhang on all sides. After you determine where the peak of the roof should be, score the crease. 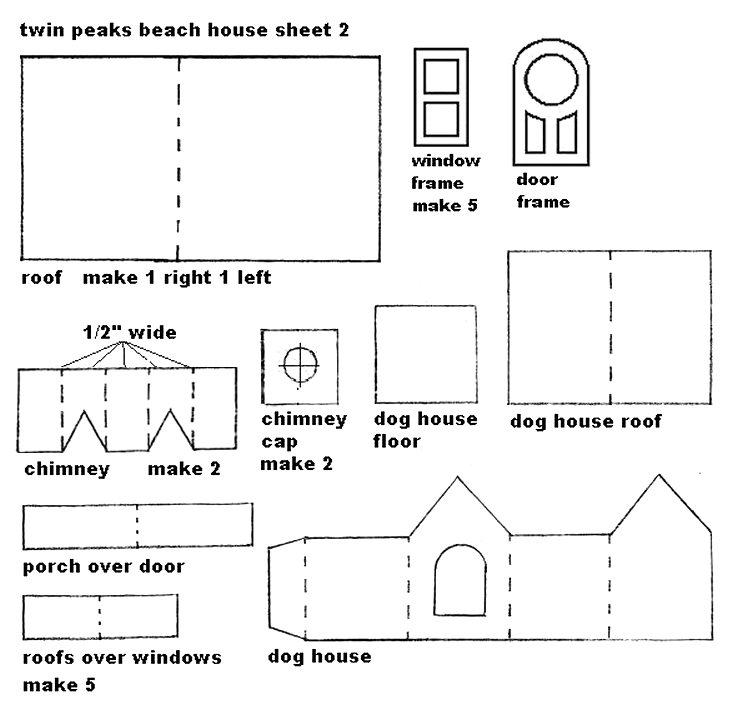 Cut the door and window frames from thinner stock, such as posterboard, cereal box cardboard, or colored card stock. 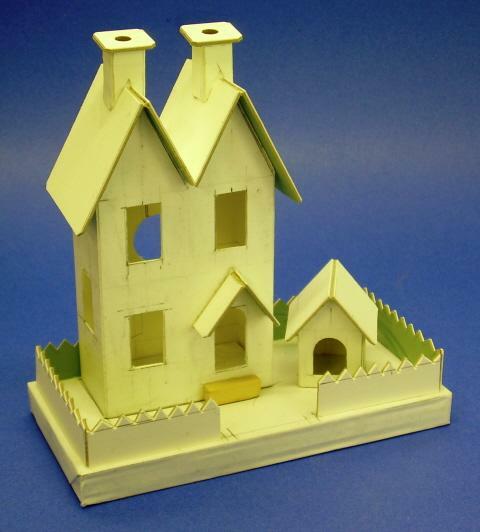 Using Elmer's white Glue-All or a similar product, assemble the house, glue on the roof and chimneys. I would do this in steps, clamp the pieces, and let them dry so that you are not trying to hold, tape, or clamp a lot of small pieces at one time. White glue works best if you apply a thin coat to each mating surface and wait a few moments for the glue to become tacky. 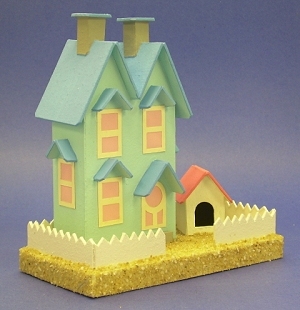 Do not glue the house to the base until you have applied the sand (below). I did not apply the little "awning" roof pieces or windowframes until I had painted the structures and doublechecked the fit, so they're not shown in all photos. The photo to the right shows the house and doghouse set in place to make certain that they fit where they're supposed to before we paint everything and glue it together. 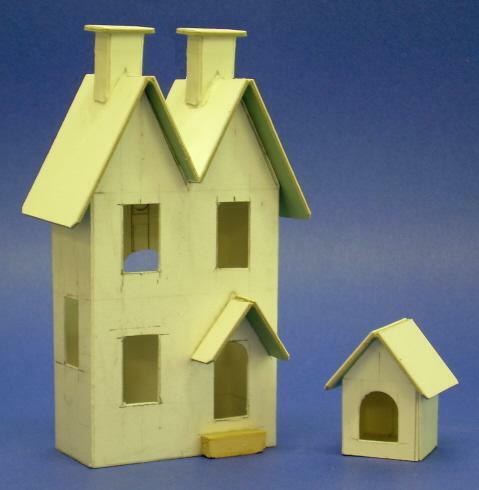 If you have cut the door and windowframes from cardboard stock, glue them on now, then glue on the awnings. I left those details until later, since I used colored card stock for the door and window fraimes. Prime the house, doghouse, base, and fence with flat white wall paint. 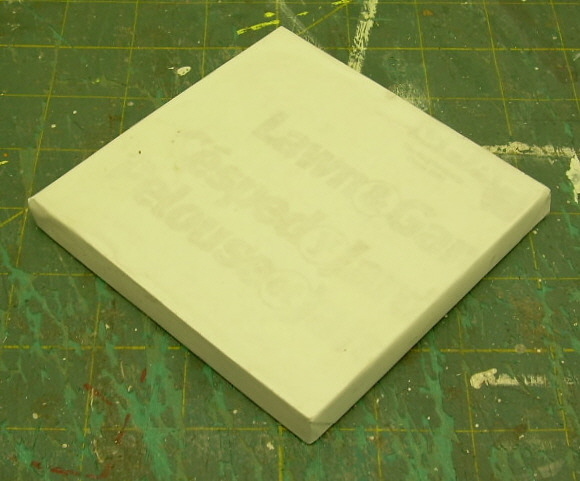 Don’t skip this step; it gives you a uniform surface for painting the final coat. The photo to the right shows how I set the pieces on improvised stands so they could dry all the way around at the same time. Paint the house in your choice of colors. I use acrylics from the Wal-Mart craft department. Finish and glue on any remaining trim details, including door and window frames and awnings. Paint the base and fence. 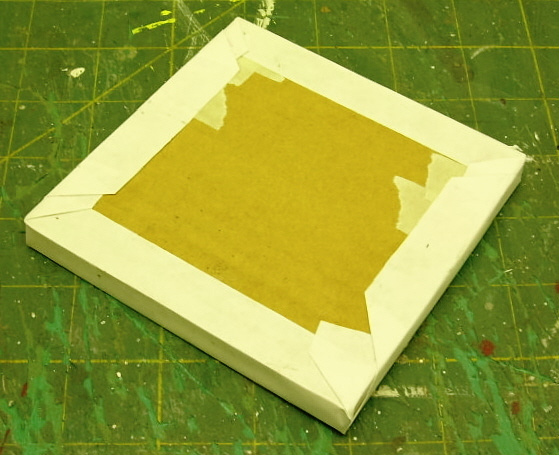 The base should be beige or sand color, something that will blend with the sand once you glue it on. Glue sand on the base. Brush a film of white glue on an area, then tamp down the sand into it. The glue dries clear, so don't judge the final effect until it's dry. You should probably count on doing this in at least 3 stages - if you try to do it all at once, you'll probably just make a mess you have to redo again anyway. Glue the window "glazing" material you have chosen on the inside of the house. Glue the finished house and doghouse to the finished base. Fill in any gaps between the house and the base with white glue and sprinkle on more sand. Add accessories that suggest a beachfront property. You can see that, when you get to the gluing, painting, and sanding stages, there's a lot of "hurry up and wait." 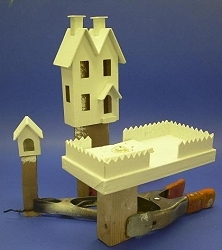 That's one reason many people who build modern putz house recreations work on two or three houses at the same time - you can work on the second house while the glue is setting on the first one, and so on. 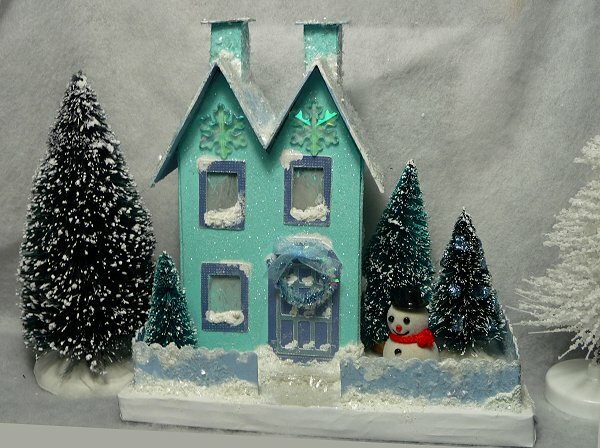 Linda McCloskey, who first contacted us in 2008, has built a Cristmas version of this house. She says: "I am glad I am on your newsletter mailing list . . . . I enjoy reading it. I appreciate all the effort you put into it. 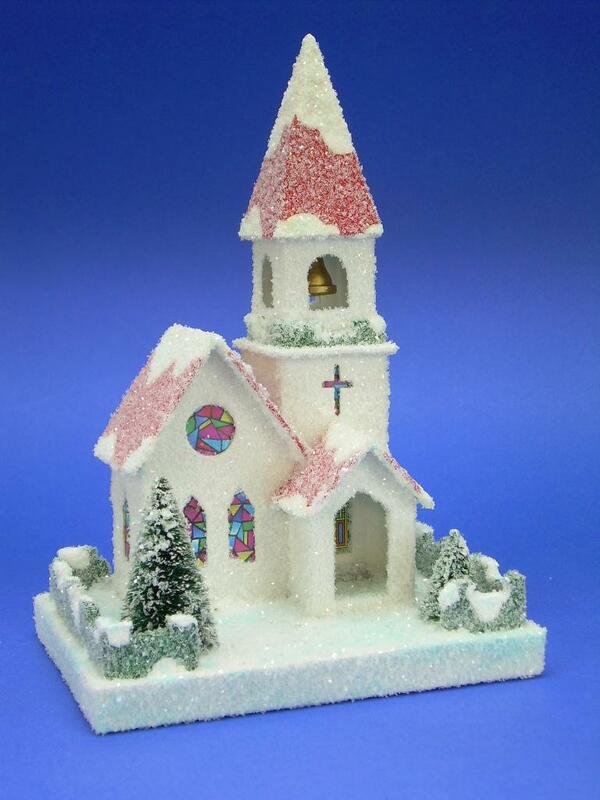 I am attaching a picture of a glitterhouse that I modeled after Howard's "Twin Peaks" plan. . . . Thanks again for your informative website." Thanks for the great photo, Linda.